At Miramodus, we produce a wide range of models that are ideal for teaching crystallography and mineralogy. Crystallography and the understanding of symmetry in crystal structures is a hugely difficult topic for many students to grasp and, consequently, every bit as difficult for educators to teach, but our models can help in that process. 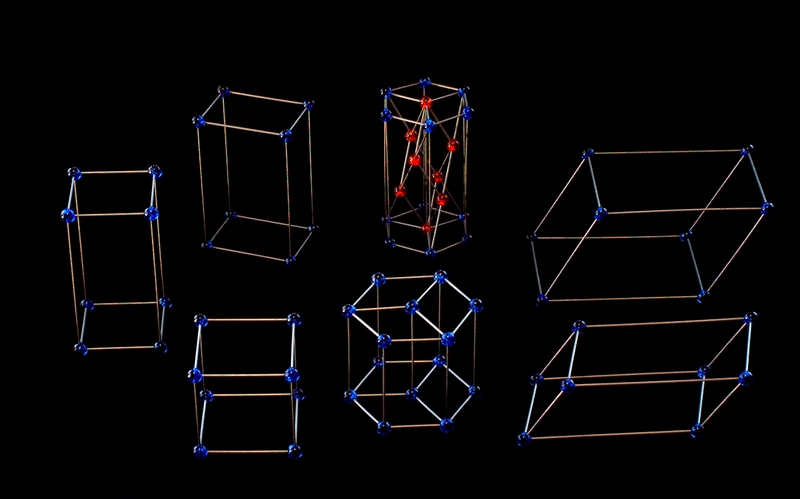 Physical models of crystal structures have long been used to help students better visualize the complex arrangements of atoms within crystalline materials. Many people claim that the advent new technology, allows the easy visualisation of three dimensions. However, the truth isn't so simple: many people simply cannot perceive depth in computer images of any kind. That's because depth perception is the result of numerous factors that go beyond simple binocular vision (which is essentially all that 3d computer images rely on). Numerous depth cues - motion parallax, relative scale, relative focus, aerial and linear peerspective, and texture gradients all contribute extensively to our ability to perceive depth. If your perception of binocular disparity is relatively weak, you rely all the more on the other cues. Our molecular models designed specifically for crystallography include sets of the 32 point groups, the 7 crystal systems, the 14 Bravais lattices, coordination polyhedra, plane groups, frieze groups, abstract depiction of space groups, highlighting of unit cells or other features and inclusion of lattice planes - if you can think of anything that you want and that we've missed, let us know and we'll happily look into making any models that you want.